Although I read the excellent On Becoming a Novelist many years back, somehow I missed reading this one through the years. The first thing I read of Gardner was Grendel. It's a short little book from the POV of the monster in Beouwulf, and it will take the top of your head off and spin it around like a buzz saw. I tried reading Nickel Mountain two or three times, but could never get past the second chapter. I'm currently reading a biography of Gardner on the elliptical. Pretty good. 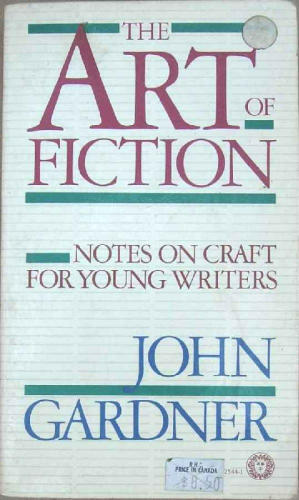 The Art of Fiction is worth re-reading several times. It's not so much of a how-to workbook, although he does get into great detail about writing poetically, down to examining in detail outlining the metrical stress of sentences. It's more of a higher level survey of what and what. Although Gardner was an academic and an expert in medieval literature, and could get pretty highbrow in his analysis and criticism, he quotes from a broad range of works, from Homer to Howard the Duck. If you're serious about writing, you should read this book.